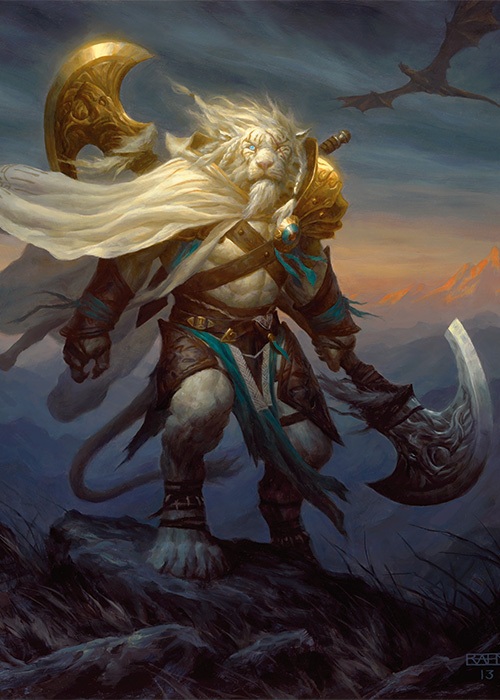 Ajani Goldmane is a member of the catlike leonin race and a Planeswalker wise beyond his years. You can read more of his story here. Ajani recently traveled to the plane of Theros looking for his friend Elspeth Tirel. Together, they journeyed into the god-realm of Nyx on a quest to kill the newly ascended satyr-god Xenagos. They succeeded—but at a price. The sun god, Heliod, struck down Elspeth with her own weapon, having no further need or desire for a mortal godslayer. You can read more about Elspeth's story here. Ajani saw Heliod kill Elspeth. He carried his friend's body back to the mortal world so her soul could travel to the Underworld. Ajani awoke, his whole body a dull ache of pain. His blurred vision resolved into lantern-lit shadows flickering on an angled white ceiling. He was in a tent, at night, and its canvas flapped slightly against the breeze. He narrowed his eye and sniffed. The scent of some herbal concoction clung to his fur, no doubt thanks to a healer who tended to him while he had been asleep. He tested an ankle, a leg, a wrist, an elbow, a claw. Everything seemed to be working. He raised his head and looked around the tent. He had been laid out on a cot that occupied the tent's center. Elspeth's cloak lay on a nearby wooden table, folded neatly next to a clay bottle. It was pure white again, all of the blood washed out, as though nothing had happened. Next to that, perched on a folding stool, was a white-haired old human whose neck and lower face were covered in rippling burn scars. The gnarled old man smiled. "Greetings, fellow visitor." Ajani kept his face impassive. The man's smile melted away. "You returned alone." The man leaned forward. "Were your travels so troubling? The healer said you would be fine in the morning." Ajani sat up in the cot, towering over the little old human. His head pounded. "This isn't about me," he snarled. Lanathos raised a single eyebrow. "No?" "Elspeth's story is over," Ajani said. "Don't you want to hear how it ends?" The old man scratched his chin. "I do, but perhaps not now." Ajani rolled one of his braids between his fingers. "We're both here, aren't we?" "My memory is excellent," the man said. "I will remember anything you say for as long as I live. Are you certain that you know how you wish me to remember her?" The leonin's shoulders drooped. "I had not thought about that." The man looked at the folded cloak, then back at Ajani. "If it is a story you wish to tell, perhaps you should start with your own." Ajani stood up from the cot, moved an empty stool closer to the little man, and sat down, looming over him. "Why would I do that?" "Your fur is a shade unlike anything I have seen among these leonin. Your accent is different as well. You told me you came from over the mountains, and then some. There's a tale there, I'm sure. But you've stopped telling it." He looked up at Ajani and stared him in the face, defiant. Between two leonin, this would be a blatant challenge, and he must have known that by now. "You came to me looking for your friend. You followed her on her quest to kill a god. She perished in the attempt, I assume, which is why you have returned alone. Her story is over now. When will yours begin?" Ajani's mouth fell open. "She needed my help!" The man looked over at the whitewashed cloak again. "Did you help?" Ajani tensed, his claws extending. His vision swam at the edges. "Brimaz may tolerate you, storyteller, but he would not be pleased to hear that you had disturbed one of his guests." The man stood. "Then I will allow you your rest," he said, "but not before I deliver a message to you on his majesty's behalf." He nearly spat the honorific, as Brimaz was not known for his formality. "The Setessans are here, celebrating a victory shared by human and leonin alike. Anthousa does not know that you have returned, and she will suspect what has happened if she discovers you alone. This would dampen spirits at the celebration, which his majesty finds unacceptable. You are to stay in this tent tonight." He lifted a hand, indicating the table. "The bottle contains a draught that will return you to sleep for the night and dull the pain tomorrow. His majesty will see you at the gymnasium in the morning after breakfast." Appealing to Brimaz's authority had been a mistake. Ajani folded his ears back, allowed his claws to retract, and plucked the bottle from the table. "You serve as his messenger now?" "He trusts me. You will have to do the same if you want the world to remember your friend." He smiled, though on his gnarled face Ajani could not tell if it was the genuine sort of human smile or not. "Rest well, fellow visitor," the man said, and then he turned and left. Ajani sniffed at the bottle. It was aromatic, earthy, and only a little unpleasant. He drank the contents, laid back down on the cot, and closed his eye. He awoke to sunlight filtering through the tent's ceiling and the smell of grilled meat and bread. The latter came from a tray of food someone had left on the table next to the folded cloak. He pulled himself off of the cot and pulled a stool up to the table, his stomach rumbling. The meat was well-spiced and the bread was warm, although it was a bit airier than he preferred. A moment after he finished eating, a young female leonin with gray fur entered the tent. It was Seza, who had found him in the wilds when he first arrived. "Good morning," Seza said brightly. "To you as well," said Ajani with a smile. He nodded his head toward the empty tray. "Thank you for the breakfast." She nodded in answer, smiling, but then her face stiffened. "You are to meet Brimaz at his morning exercises. I will take you to him." "You and Lanathos have been quite formal." Ajani raised his eyebrow. She looked around furtively, then spoke again, now much more quietly. "Brimaz considers you a great friend, but your situation here has worsened. We may have defeated the nyxborn army with the Setessans, but this cost us many soldiers, and not everyone agreed with the king's decision to march with the humans. Pyxathor's separatist faction was small before, but he has been quite active since we returned to Tethmos, and his influence has grown. This is the first time Brimaz will have seen you since the battle. Pyxathor's men will be watching." "A few of my friends have begun listening to him, and I have been trying to pull them back. But I will need to treat you somewhat coldly once we are outside the tent, or they will suspect your influence." She looked at the ground. "I am sorry." "We all give things up for our causes, do we not?" He smiled. They left the tent, and she led him through the burgeoning city for a few minutes, taking him to a wall of curtains. She pulled one aside, and motioned for Ajani to enter. The gymnasium itself was somewhat less grand than Ajani was expecting. The humans here often built huge freestanding building complexes in which to exercise. This gymnasium was little more than a curtained-off area that contained wagons of weights and racks of weapons, but it was still more than he would have been able to find in Naya. And at the center of it all was Brimaz, standing tall and strong with his scar-crossed chest bare in the morning light. He was not wearing his crown, but his bearing and the berth that the other leonin gave him made his position clear. Seza stopped just inside the curtains. "Brimaz awaits you." "Thank you," Ajani said, and then he entered. Pyxathor stood at the edge of the gymnasium with crossed arms. There were many other leonin present, many from Brimaz's personal guard, and their gazes shifted between Pyxathor and the king. Ajani made his way to the center, and Brimaz nodded to him. "I wanted to thank you for your counsel," he said. "My army fought alongside the Setessans, and we routed the nyxborn assault. Last night, we celebrated the victory together, human and leonin alike, sharing cups. I think we have made some progress toward a lasting peace." The king's voice had a newly acquired edge, and the speech was clearly not for Ajani's benefit. Ajani nodded his best wise nod. "That is excellent." Brimaz looked him in the face. "You always tell me that you are from far away." Ajani considered his surroundings. Every other leonin was watching them now. This was not the place to explain, even if he thought he could. Ajani waited for another question, but none came. 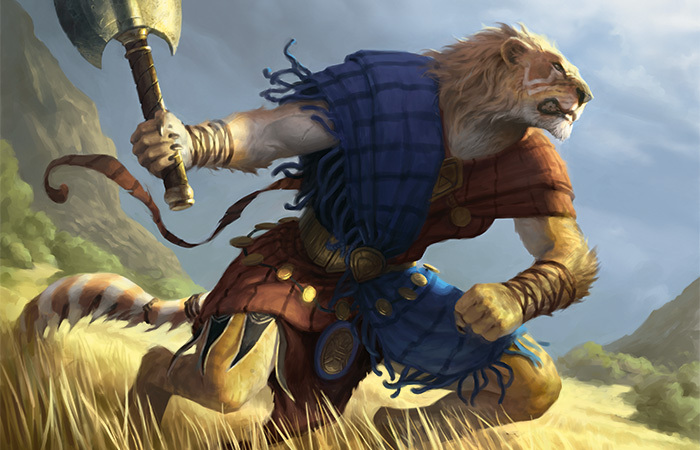 Brimaz turned away from Ajani and toward a nearby weapon rack, on which rested a wooden shield and several wooden weapons. He put his arm through the shield's leather strap, picked up a sword with his other hand, and turned to Ajani. "You may have your choice of weapons." Ajani's tail tensed. "We are to fight?" "Your fur is white. Your accent is not ours. You did not understand the tales of the Champion. You are not one of us, and you choose to tell me nothing more. But you are clearly a capable warrior, and I am in need of a sparring partner." Brimaz continued staring at Ajani, defiant. "I don't want to fight anyone," Ajani said, averting his eye. "After all the trouble I went through to have these made?" Brimaz extended a claw toward a one-handed axe and a sword, each with wooden blades, on the same rack—each made almost exactly in the style of the weapons that Ajani had become accustomed to carrying here. Ajani sighed. He padded to the rack and hefted the axe in his right hand and the sword in his left. They were both well-built, with a nice weight and balance. For a moment, he longed for his more familiar double-bladed axe. Such a weapon would have marked him even further as an outsider, but perhaps that was not so important then. The king led him to an open space nearby. "They are sufficient?" he asked, bracing his round shield on his extended left knee. And with that, the king was on him. Ajani backpedaled, but the taller leonin was too fast. Ajani cut with his sword for Brimaz's right, but the king's shield snapped into a block with lightning speed. Ajani dodged right and swung with his axe, but Brimaz was too close, and only the shaft made contact with the king's shoulder before Brimaz shoved the tip of his wooden sword against Ajani's throat. Ajani froze. Brimaz nodded, and backed away. "Again." Brimaz was once again the first to move. Ajani dropped his left arm to thrust his sword below Brimaz's shield. At the last moment, Brimaz dodged to the left—Ajani's blind side. Ajani's thrust only pierced air. He raised the axe in his right hand to block an attack from his blind side just as something tapped the right side of his neck. Ajani's face betrayed his frustration as he returned to the starting point. "Do they not teach the wrap cut where you are from?" asked the king. "Perhaps the swords are not double-edged?" Ajani growled and settled into place. Brimaz's face remained impassive. Brimaz came directly at him a third time, but Ajani matched his approach. Brimaz raised his shield to foul Ajani's axe on his right side, and Ajani heard but could not see their swords clashing on his left. Brimaz's shield shot past the right side of Ajani's head, shoving his axe further out of position. The king's shield hand grabbed one of Ajani's braids and yanked downward. Ajani staggered, and then Brimaz shoved him over. Ajani tumbled onto the ground. By the time he recovered, Brimaz was pointing a sword at his throat. Brimaz placed his sword between his right arm and his body. "You were right," the king said, reaching his hand down to help Ajani stand. "You don't want to fight, and that is your problem." Ajani grasped the hand. "Is that so wrong?" Brimaz pulled Ajani a bit closer than speaking distance as he stood. "Everything here is a fight, Ajani. I fought to make my soldiers march alongside humans. I fought to keep order when our mixed army faced the nyxborn. Now we are back, and I must fight those of my own who prefer to live apart from every other civilization. I am happy to have you here, but I need you fighting for something, or your presence only makes my fights harder." Brimaz turned a little, and gazed at the other leonin. They were watching, and listening, though now only out of the corners of eyes and ears. "They don't trust you because they don't know who you are," Brimaz whispered. "They will need answers before you can truly be one of us." He turned back to face Ajani again. "I will be busy for the time being with the Setessans. The next time we speak, I will ask you what you wish your role in my city to be." Ajani nodded. "Yes, your majesty." Brimaz smiled, finally, although only a little. "You know I do not stand on titles among my friends." "So we are still friends?" The hint of a smile faded, and Brimaz stole a glance at Pyxathor. "In private, we will always be friends, but very little of my life is private these days." "It was good to see you." Ajani nodded. Brimaz turned to rack his weapons. Ajani placed his on another rack nearby, and left the gymnasium. He wandered the streets for much of the morning, a white-furred ghost among Tethmos's darker leonin. He could always leave, of course. There were many planes, each full of sights and sounds, some of which even had other leonin who might take him in. But Brimaz was right. He had not wanted to fight, even though there were many things here to fight for. Oreskos's right to exist in peace was one, although that was more properly Brimaz's fight. Elspeth desired to punish Xenagos for how his ambition had affected so many on this plane, but that had not truly been Ajani's fight either. Perhaps he needed to find his own. Then Ajani remembered the sight of Heliod striking Elspeth down, and he smiled a savage and joyless smile. He returned to his tent, collected his belongings, fastened Elspeth's cloak around his shoulders, and set out on the road to Meletis. As he traveled, he pondered the nature of the gods. Xenagos demonstrated that one could become a god on Theros if he could convince enough sentient creatures to believe. It was clear that Heliod was not, strictly speaking, a force for good, and yet at some point enough people had chosen to believe in him. What would happen if enough people chose to stop? The journey was long, and it was a relief to see Meletis's gleaming walls and buildings in the distance as night began to fall. He approached the gates with flattened ears and a contrite bearing, hoping to appear docile. The two guards' postures shifted from alert to alarmed to curious as they saw him get closer, and Ajani stifled a satisfied smile. "I seek Heliod's temple," he said quietly to the guards when he arrived at the gate. One of them seemed suspicious, but the other was happy to provide him with directions, although he still spoke to Ajani as one might speak to one's pet cat. 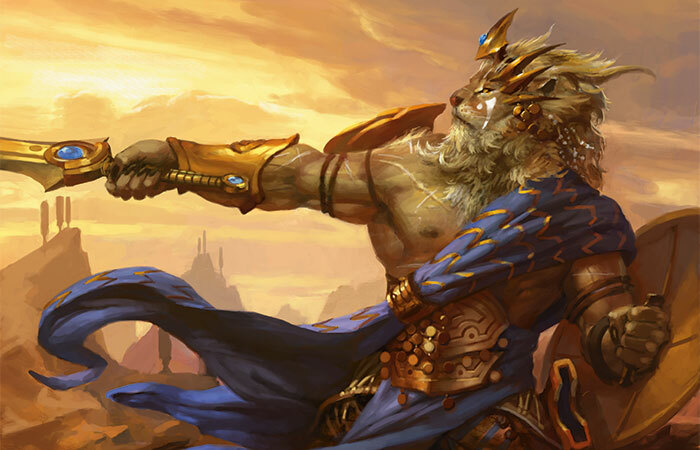 After twenty minutes of navigating the Meletian streets and the stares of their human occupants, Ajani found himself at the base of the stairs outside the largest temple to Heliod in all of Theros. Ajani climbed up the stairs and entered the building. Inside, it was civilized and perfect, every angle between unblemished marble walls constructed exactly, and a bright but sourceless light suffused everything within it. Ajani was the only leonin inside; the other supplicants, perhaps eighty in total, were all human, and their organic, rounded forms seemed out of place within the temple's angular perfection. Many of them stared openly at him—most at his body, but more than a few at his weapons. He looked to his left; there was a gleaming golden rack, on which a smattering of swords and daggers had been placed. Ajani flattened his ears and placed his axe and sword at the bottom of the rack. Much of the attention subsided, and a young woman dressed as a temple attendant approached. "We do not often have leonin guests," she said softly, her dark skin and hair shimmering in the unearthly light. He looked down at her sternly, and matched her volume. "I have come to believe that only Heliod can answer the questions I have." Her face softened. "Devotion to the gods is rare among your kind." "I have had unique experiences with them," he said, keeping his face calm. Ajani stood up a little taller. "I was present," he said, his voice loud enough to carry a little, "when the god of this temple slew a woman who was both his Champion and my friend." The attendant stiffened. The men and women near them paused, and began to listen. "How do you know it was Heliod who did this?" Ajani raised an eyebrow. He raised his voice further again, but kept his tone soft. "His golden halo is quite distinctive." The attendant's eyes went wide for just a moment before she recovered. "And what question do you have for our divine patron?" "This friend of mine," Ajani said, stepping past her and projecting loud enough for all to hear, "consented to become Heliod's champion. To do his bidding, to perform great deeds on his behalf, to keep safe those of us who can only pray to the gods for safety." He wanted to spit out the last part, but instead kept his voice even, playing the picture of provincial naiveté. "I assumed that she would be rewarded for this service. That she would be thanked, lauded, given an appropriate reward for filling the position she had accepted. And instead she was struck down. What am I to think of a god who treats a loyal supplicant with such ingratitude?" Not everyone was watching, now, but they were all listening. A young man approached, likely no older than fourteen, with blue eyes that faded into milky whiteness as he walked. "What is a god to think of a champion who would exceed her station?" His voice echoed with an unnatural depth, and the surrounding men and women all dropped to their knees. Ajani did not even incline his head. "You have come to sow discord in Heliod's temple." The boy's resounding voice rattled Ajani's bones. "I have come to ask Heliod a question." The oracle narrowed his eyes. "This place is for those who respect Heliod's divine power. If you do not count yourself among the believers, you should leave." Ajani stepped forward, feeling bolder now. "I believe that Heliod is a god. I believe that the people of this temple venerate him for his divine might. I believe it was not so long ago when all of his priests were thrown out of this very temple, forced to flee for their lives. And I believe that he slew his Champion in cold blood." "She slew one of his kind as well." The voice was deafening, and Ajani turned his ears away from it. "The mortals of 'this place' have a place, and she did not consent to remain within it." Fire burned in Ajani's belly. "I have seen what happens to mortals who remain in the places the gods assign them. When the priests of this temple were scattered to the winds, I met one of them, Stelanos, on the road. He was a blind and broken wretch. He even refused to let us bury the dead around him. 'Leave us as a warning to others,' he said. 'The gods have forsaken us.' He drank nightshade to end his misery." The boy crossed his arms. 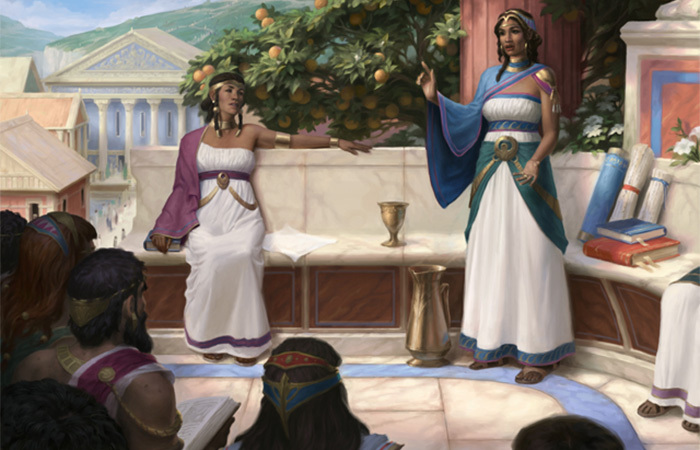 "If you continue to sow dissent in Heliod's temple, you will meet the same end that Elspeth did." Ajani smiled a joyless smile. "Then I will not sow dissent here." The boy scowled and gestured toward the temple's entrance. Ajani turned, retrieved his axe from the rack at the door, and walked out into the twilight. The humans all stared after him as he walked, but now, perhaps, not all of the stares were hostile. He made his way to the edge of the temple complex, and discovered that a few of the supplicants were following him. At the edge of the complex, he turned to face them. "You saw Heliod kill his own champion?" asked a young woman. "His priest, left blind and broken to die on the road?" said an older man. He walked with them, and told them of what he had seen in Nyx, of Heliod's vengeful act of murder, of the true nature of the gods. 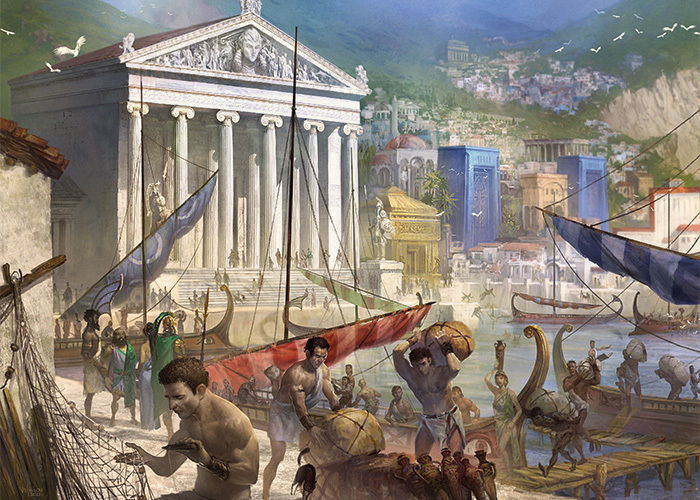 "They are like a great flame," he said, gathering a small crowd as he paused in one of Meletis's public squares. "Before the spark, there is nothing. After the spark, there is light and heat and destruction. But without those who believe, there is nothing for the fire to burn. And if Heliod treats his Champion and his oracles as little more than kindling for his flame, what hope do those of us who cannot hear his voice have?" A skeptical-looking woman stepped forward. "You cannot snuff out a god like a cookfire." Ajani regarded her with stern kindness. "A fire with nothing to consume must die, no matter how large it has become." She scratched her chin, and faded back into the crowd. Another stepped forward, an older man this time. "You seem to think we created the gods. What should we create instead?" "Create something for yourselves!" Ajani nearly roared. "A family, a home, a life. Friends and acquaintances and happiness. Something that is yours, not something far above you that can destroy everything you cherish on a whim." There were many nods as the crowd began to disperse, many of its members speaking among themselves. They spoke of their ambitions, their families, the things they loved, and how they could better their lives for themselves. One spoke of how often the gods had helped him. Rarely, he said, and not much. Those around him nodded. One woman remained with him. "You said some interesting things, and I would like to hear more of them. Do you have a place to stay?" Ajani smiled, and shook his head. "I did not before." He stayed in the city for several days, sharing his message, subsisting only on the kindness and sympathy of those who found his words inspiring. He often slept in the homes of those who listened to him. Twice he slept on the streets, but each time Elspeth's cloak was enough to keep him warm through the night. He found many who rejected his ideas, but a few more each day seemed sympathetic, and perhaps those few returned to their lives with new ideas about the divine forces that live in the skies of Theros. On his ninth day in the city, while eating breakfast purchased from a street vendor with coins given by his previous night's host, he heard a human speaking loudly on a nearby corner. "The gods have betrayed us," she barked, "and yet we feed them with our belief!" She had a small crowd gathered, and although she was neither as eloquent nor as kind as Ajani had been, it was clear that the message had begun to spread. It was time to go home. The journey from Meletis back to Oreskos was long, but Ajani did not mind. He needed the time to construct a worthy monument to Elspeth. A story that would spread far and wide. A story about a worthy mortal, ordinary in birth but great in deed. A story that would inspire leonin and human alike to look up at the stars and say no, I will not lend my strength to these capricious and unfeeling gods. A story that would someday shake the very foundation of Nyx. Soon, Ajani thought to himself as he saw the sun setting over the gates of Tethmos, no leonin would think of the story of the Champion the same way. It would take time for this version of the story to reach the humans, but stories had a way of spreading. Two armed leonin guarded the gates. One of them stepped forward as Ajani approached. "You are Ajani, yes?" "Brimaz wishes to speak with you. I will take you to him." The guard led him through the darkening city to the king's hall. A great fire burned in its center, surrounded by many leonin and a single gnarled old man. As Ajani entered the hall, Brimaz stood. All eyes turned to Ajani, and the conversation ceased. Only the crackling fire made a sound. Brimaz spoke. "It is good to see you again." Ajani stepped forward. "I am ready to tell my story." Brimaz smiled, and sat. The circle around the fire expanded, leaving a space for Ajani. He stood just outside the space. "Many of you have wondered where I came from," he said, and his voice echoed within the hall. "I traveled far to be here, and none of you have likely heard of my home. I was young when I left, and I have traveled much since then. I am most truthfully from nowhere." Pyxathor, sitting nearby, snorted; a few others looked skeptical. Lanathos scratched the scar tissue on his chin, pondering. "I met the lady Elspeth several years ago during my travels, and it was she who I followed here. She was a great warrior. She took up Heliod's mantle, becoming his Champion. Xenagos, newly ascended to godhood, wronged her greatly, and she resolved to punish him for his hubris. I chose to go with her. She led us into Nyx, the land of the gods. She completed an ordeal for Erebos, who allowed us to pass to Xenagos's domain. She slew him with a spear blessed with Heliod's power. And Heliod, enraged by the death of a god, even one who usurped the natural order to achieve divinity, killed the woman who was his Champion in cold blood as I watched." Many of the leonin around the circle murmured among themselves. "Many of us do not think much of the gods, but they are very real. However, they are our own creations. They came into being when the first believers asserted their existence, and ever since, they have only grown in power." Ajani surveyed the circle of leonin, which was now rapt with attention. "Thassa lives in the depths, oblivious to the boats and lives and families that her pets destroy. Erebos jealously guards those who find themselves in his realm, and allows only pathetic mockeries of them to escape his grasp. Heliod is a childish, petty creature, and yet he is what we made to lead the pantheon of our own creations. We can do better. "I spent several days in Meletis spreading this message. That the gods are our creations, a fire created by a spark of belief. That their power to consume is sustained only by our beliefs. That a fire, deprived of kindling, must go out." Ajani smiled slightly. "As you have observed, I am not truly from this place, but I share your frustration with the gods, and I will fight them in my own way. If you do not wish me to stay, I will go, but I will continue to spread my message to the other poleis." And again, the only sound in the hall was the crackling of the fire. Elspeth's cloak fluttered behind Ajani in the slight breeze. "Welcome home," Brimaz said. Lanathos grinned. Several of the leonin nodded, Pyxathor among them. Ajani entered the circle and sat.